A man has raised alarm after an officer of the Federal Road Safety Corps chased him for over 25 minutes in Abuja. 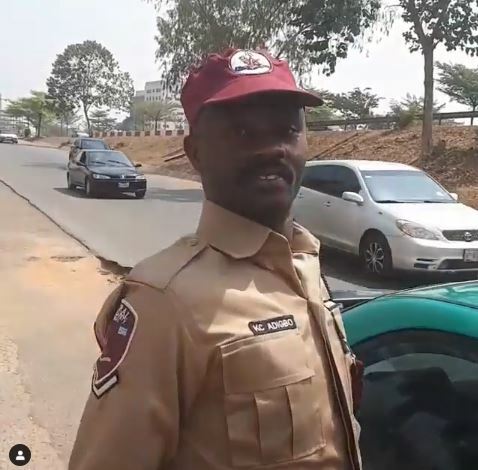 A Nigerian man, Chukwuma Okere was left in a state of shock after a Federal Road Safety Corps officer reportedly chased him for over 25 minutes in Abuja. Okere said that he was scared and decided to divert to a police checkpoint and stopped. When the FRSC officer confronted him, he asked for an ID card, but the officer couldn't tender any. "Today I had a scary experience with a "supposed" road safety officer who chased me from central area abuja to mabuchi in a green taxi. As I was driving I noticed I was being followed by a green taxi which scared me because most day time car snatchers usually move around in green taxis. The taxi driver and the passenger were seriously flagging me down to stop so I hurriedly drove towards mabuchi Bridge were I know has police check point. When I stopped, the man in the video claimed he's a road safety officer but didn't have any I. D on him. He claimed he saw me making a call whilst driving and that was the reason he had been chasing me around town for over 25 minutes. When I started shouting he entered his taxi and ran way. If this is truly a road safety officer then the Federal Road Safety needs to call people like him to order. Why would he chase me around town without a road safety vehicle or bike? Not even in the company of another officer?. This event shook me, I won't lie and he went as far as claiming that he had marked my car which I perceived as a threat because his identity was questionable. This is a call to the Federal Road Safety and security agencies to look into this matter, fish out this person, determine whether he is an impostor and take necessary action towards same. If he's truly an officer then he ought to be severely disciplined and given fresh induction on how to conduct himself as an officer of the Federal Road Safety Corps." You are a coward. You claimed to have stopped at a Police Check Point. Why did you not get hold of the "Road Safety Officer" and involve the Police? Why will you allow him to walk away when he could not produce his ID card, instead, you were there making loud mouth. There is no law that says a law enforcement officer must arrest you with their official vehicle or motor cycle, rather, the arresting officer must properly identify himself and inform you of your offense, before taking you to their nearest office for proper booking. Alternatively, you should have gone to any nearby Road Safety Office to lodge formal complain on the issue of identification of the officer, to avoid you living with the fear that some kidnappers are after you.